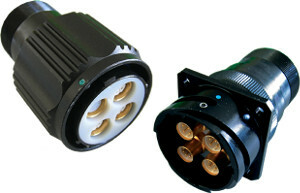 Glenair series ITH connector with Octobyte™ contacts is available with fully dedicated Ethernet protocol or in a combo version where a mix of signal-power and Ethernet is required. RoHS compliant, IP67 (IP68 on request) exceeds performance expectations typical in harsh environmental applications found throughout Rail and Industrial markets. OCTOBYTE™ contacts are vibration resistant and available to work with ETHERNET cables from CAT 5 to CAT 7A, MVB-WTB, RG58 Coax. 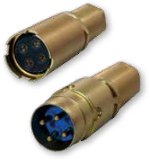 ITH connectors with Octobyte™ contacts are easy and fast to assemble, making them the best solution for harsh environment applications where signal reliability is a must. Tested for compliance according to EN50173-1 standards set for CAT5E and CAT7. Testing was conducted using 12 jumpers, each 7.5 meters in length for a total of 90 meters.